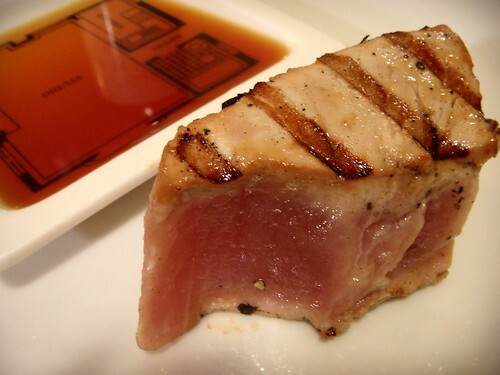 rare grill seared tuna steaks with a tangy fresh dashi ponzu sauce, originally uploaded by aarn! +4th March, 2009+. got some nice thick tuna steaks from new deal fish market, cut them into 1/4-lb chunks, patted them dry, and lightly tossed them around in a mixture of sweet white miso paste, soy sauce, salt and pepper, then set aside covered in the refrigerator. for the ponzu sauce, took 1/3c. of fresh dashi stock (see 'fresh dashi miso soup'), mixed that with 1/3c. soy sauce, 1/4c. lemon juice, and 1T. seasoned rice vinegar. seared the tuna for about a minute on each side on a clean, extremely hot, oiled grill, then plated with some of the ponzu sauce.